Jacqueline Cornforth, Artist Nyapula Morgan and Delwyn Everard (c) Jacqueline Cornforth. Reproduced with permission. On the 22nd February, our Deputy Director Delwyn Everard and I travelled to Western Australia for 5 days to provide Indigenous and non-Indigenous artists in Perth and Wiluna with free legal advice. The aim of the trip was to increase access to legal advice and information on arts related matters for Indigenous artists and their organisations. With the help of Ron Bradfield and the Artsource team in Perth, we successfully booked out 1.5 days of legal advice appointments for Indigenous and non-Indigenous artists. These appointments varied in content however we addressed a variety of Arts Law issues including copyright, moral rights, Indigenous Cultural and Intellectual property (ICIP), licensing, contracts and business structures. It was so wonderful to meet such enthusiastic Perth based artists who have such exciting work opportunities ahead of them. While in Perth we also met with Jackson MacDonald, a local law firm, whose team are eager to work with Arts Law and the Artists in the Black program in the future. I was able to share some basic tools to assist with cultural understandings when engaging with Aboriginal and Torres Strait Islander peoples. With the support of Department of Aboriginal Affairs WA, Delwyn and I were able to travel to Wiluna and work with the artists and art centre manager Tracey Luke at Tjukurba Art Gallery. Tracey was so fantastic in promoting the Wiluna Wills Workshop that we delivered over 2.5 days that week. Posters were up all over the town and it was great to see the locals and local business support positive initiatives in community. On this visit, we offered the Wills service not only to Aboriginal artists, but to any Aboriginal member of the community. 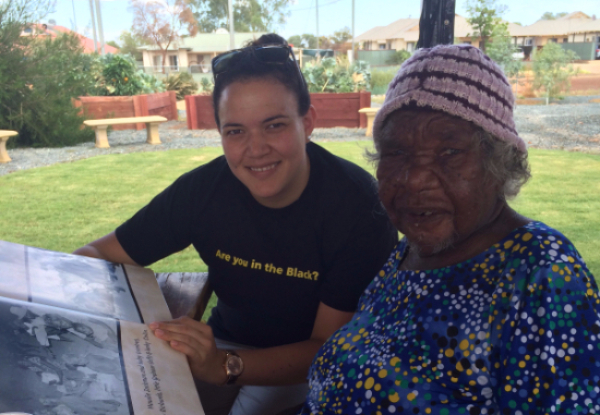 As soon as we arrived in Wiluna we met some of the artists and elders of the community. Their carers from the Home and Community Care Centre brought them to art centre where we shared lunch and talked about why we were in town. We talked about what a will was and how beneficial it can be to have one, especially for successful artists like those at Tjukurba. Over the next couple of days we met so many wonderful people of the Wiluna community. They shared so many amazing stories about where they came from, what they did for a living and how they came to live in Wiluna. Two artists and elders of the community in particular were so kind, had amazing art work and were full of stories. Although there was a language barrier we got our messages across and were privileged to have one of the elders share with us her family's stories. This Artists in the Black trip was definitely a learning experience for all involved. Special thanks to Ron Bradfield and Anna Richardson from Artsource in Perth, Kylie Wilkie and Jackson MacDonald staff, Christine Scoggin from ACHWAA, Mike Hayles from Minter Ellison, Tracey Luke and the wonderful artists from Tjurkurba and the community of Wiluna. The response from artists and arts organisations throughout the week was enthusiastic, with many asking when Arts Law and Artists in the Black would be back. Jacqueline Cornforth is the Artists in the Black Coordinator at the Arts Law Centre of Australia.